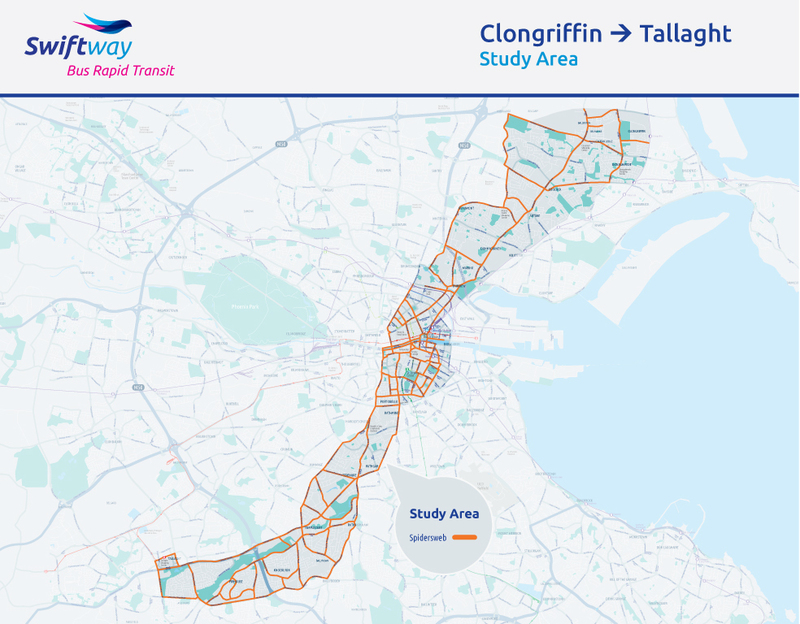 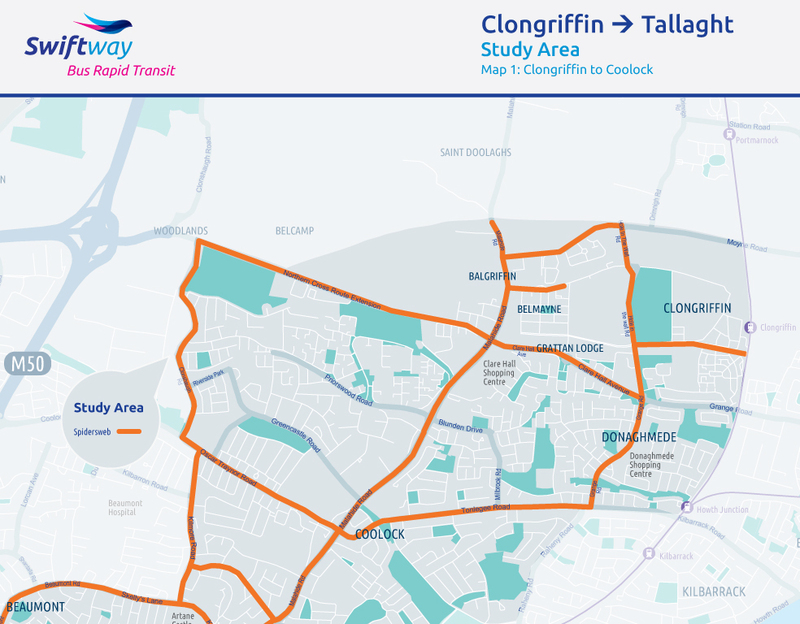 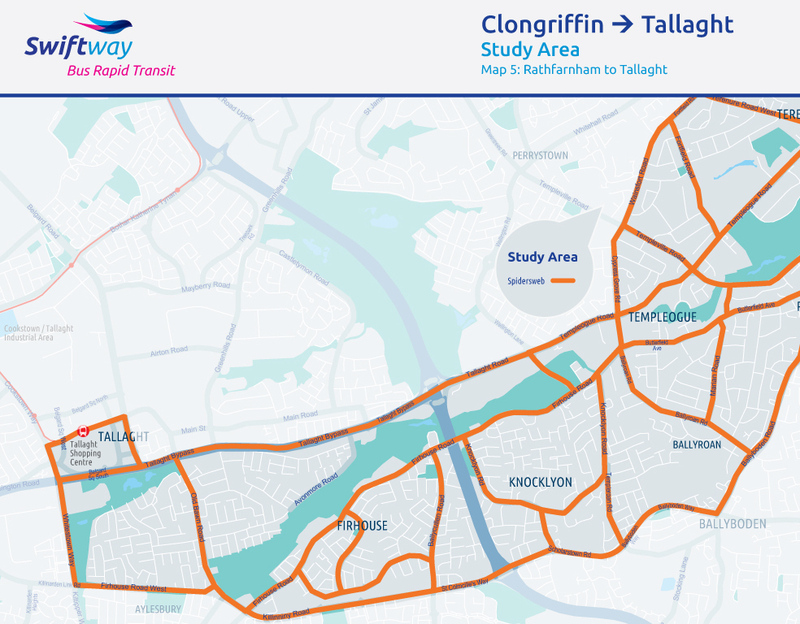 This scheme is intended to serve the busy corridor linking Clongriffin, the City Centre and Tallaght. 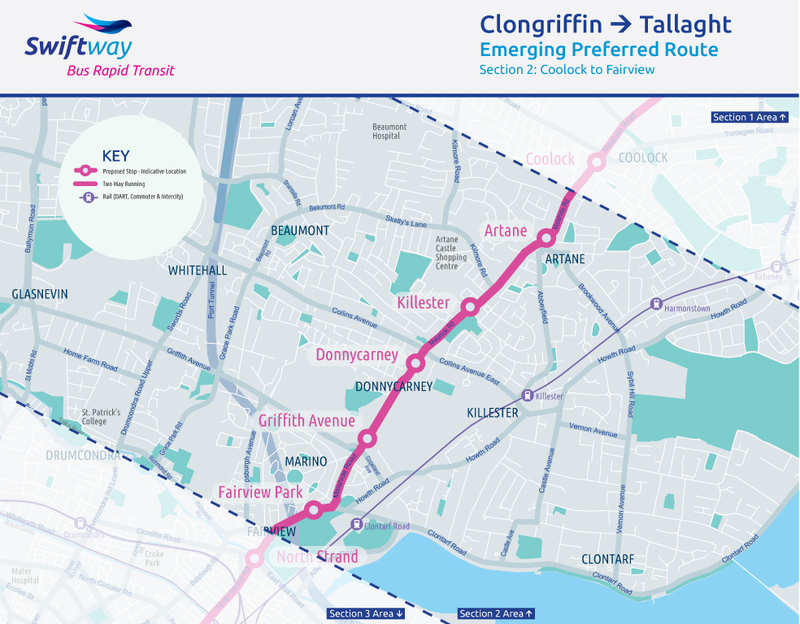 While an Emerging Preferred Route has been identified between Clongriffin and Rathfarnham, more work needs to be carried out on the Rathfarnham to Tallaght section. 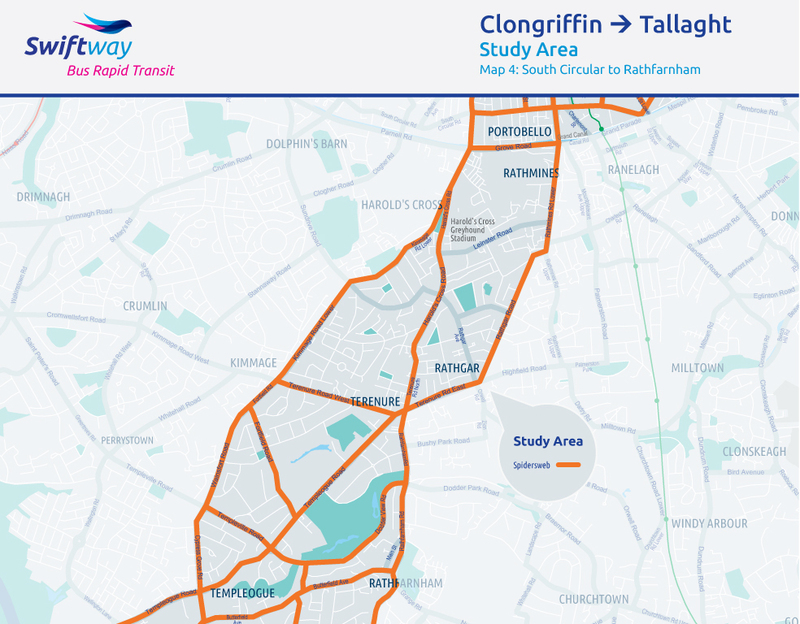 Accordingly, this description focusses on the section between Clongriffin and Rathfarnham. 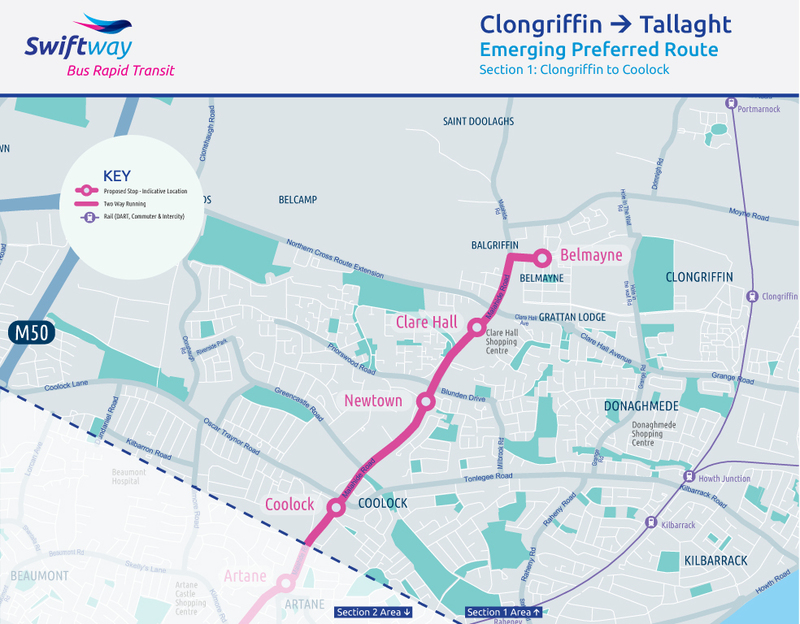 The proposed service starts at the north end in the Belmayne estate located off the Malahide Road. 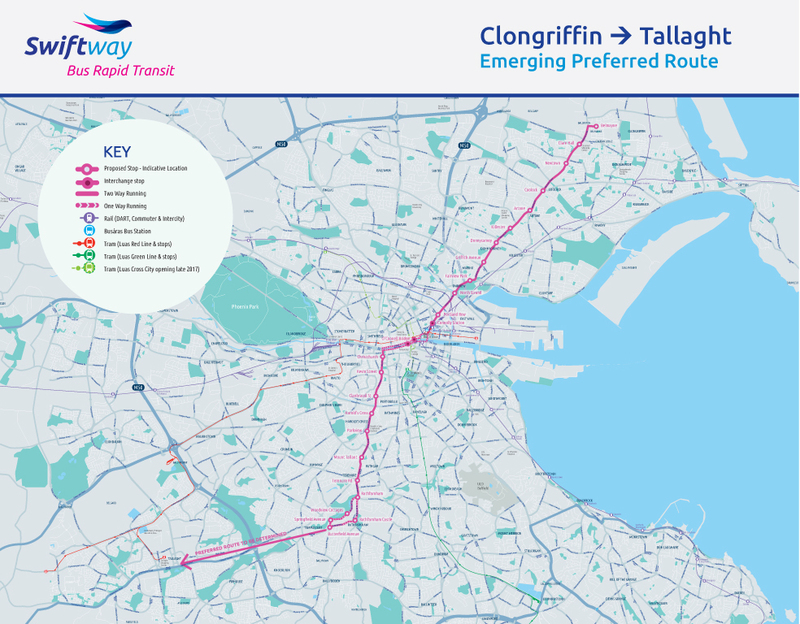 It then travels southwards along the Malahide Road to Fairview, with seven BRT stops located along this section of the route. 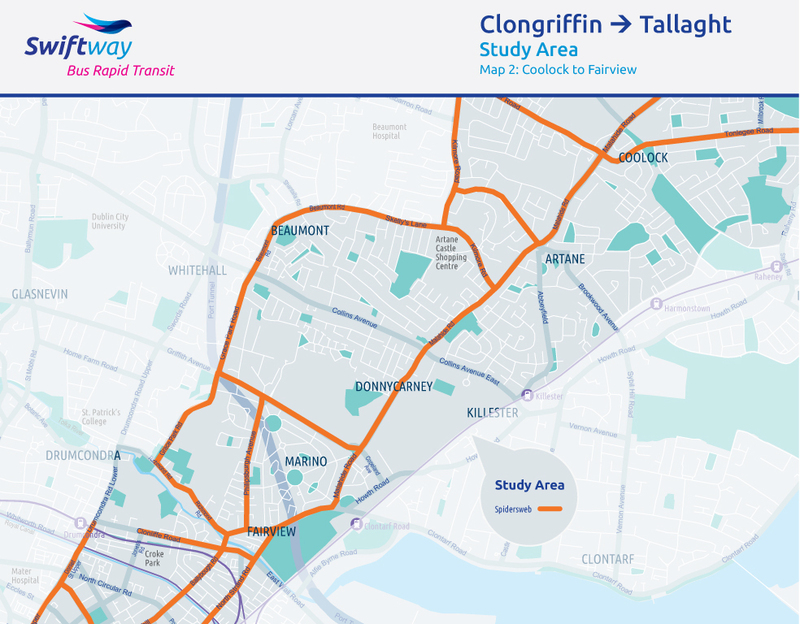 The route then continues along Fairview, North Strand Road and Amiens Street, with a key stop located at Connolly Station enabling transfers to rail, Luas and national bus services. 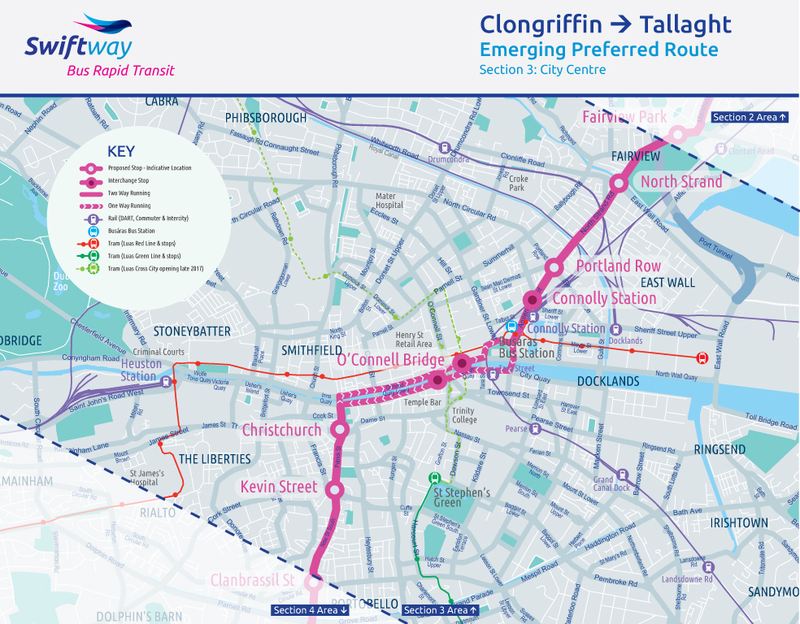 Crossing the River Liffey on the Matt Talbot Bridge, the service then uses the North Quays and South Quays to connect to Christchurch via Winetavern Street, using a contraflow lane on Winetavern Street for the southbound service. 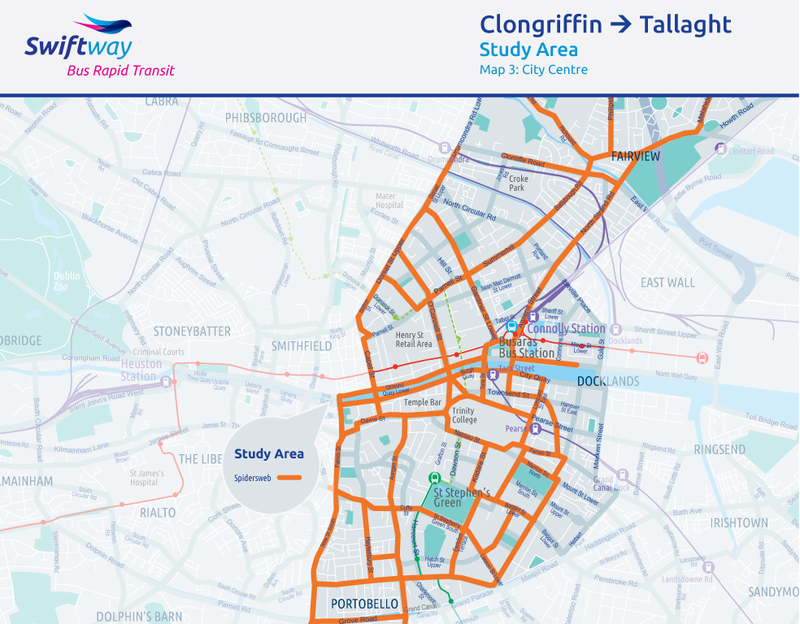 The scheme continues southwards along Patrick Street, Clanbrassil Street and onto Harold’s Cross Road. 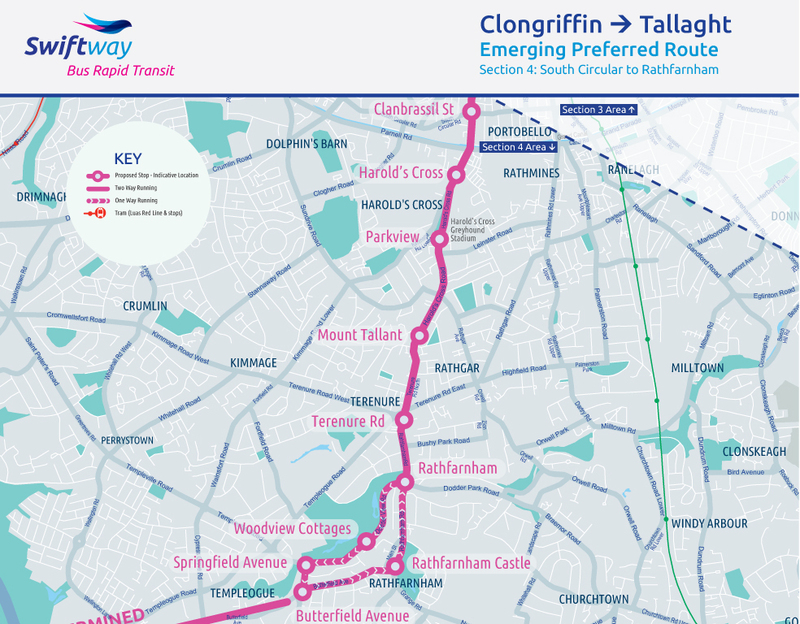 With stops located at Park View (beside Harold’s Cross Greyhound Stadium), Mount Tallant and Terenure, the service passes through Terenure and onto Rathfarnham Road. 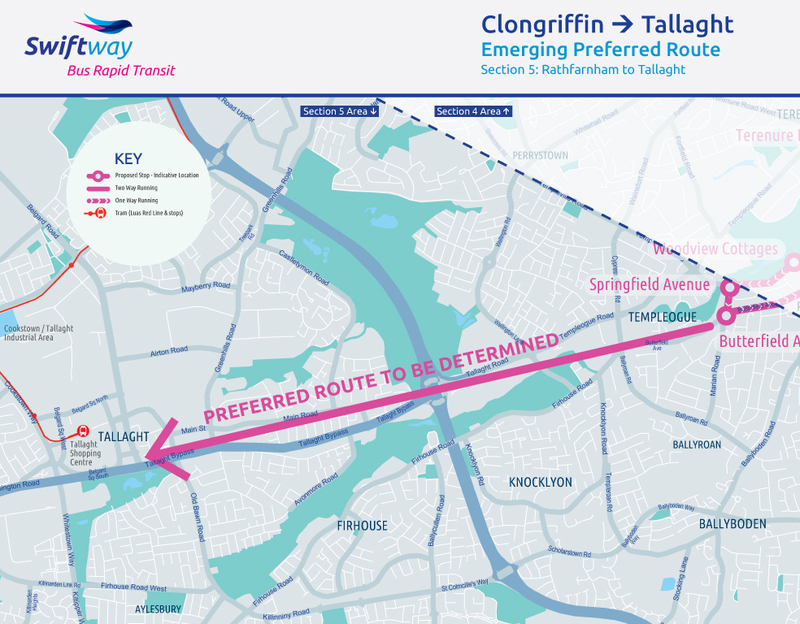 Upon reaching the junction with Dodder Park Road, services will operate in a one way loop pattern, running southbound on Dodder Park Road, Springfield Road and Fairways, before returning northbound along Butterfield Avenue and Rathfarnham Road.